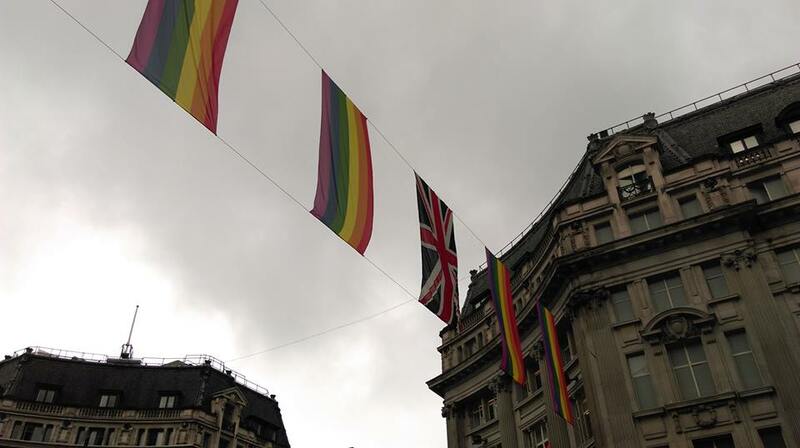 Pride flags flying over Oxford Street on the weekend of the LGBTQ+ ALMS conference. My place in Heritage & Culture Warwickshire is as an Archive Assistant at the Warwickshire County Record Office, and my background is an MA in History at York. I’ve always been keen on research that seeks to bring to light the people and voices that history had otherwise forgotten, the minority voices, the silenced voices. This, I think, is part of what appeals to me in the Our Warwickshire project – it’s a chance for anyone to share their stories, it reaches out to new audiences and new voices. With that in mind, I recently attended a conference in London relating to LGBTQ+ history in archives. For those who are unfamiliar with the abbreviation, it stands for lesbian, gay, bisexual, transgender and questioning, with the ‘plus’ representing all other minority genders or sexualities. It was an invigorating conference, filled with energy and great minds asking challenging questions. Some major themes related to how accessible and findable records relating to LGBTQ+ history are, and also how limited they currently are. Upon returning to Warwickshire, I decided to have a look and see how much of a challenge it is to access this history here. Imagining myself as a casual researcher, I tried to find any records on LGBTQ+ history, simply by searching for modern day terms on the record office website, the online catalogue and the Our Warwickshire site. The result was, I confess, a bit disappointing. Other than items and articles on Gaydon or Gay Street – not what I had in mind! – all I could find were a brief mention in an article, and also in a blog entry. Rommi Smith said in her talk, ‘I found comfort in my mirrors.’1 There is little comfort for LGBTQ+ individuals looking to find their ‘mirrors’ in our archives at the moment. Are we then to assume that there were no gay and lesbian, bisexual or transgender folk living in Warwickshire in the past? This is the danger that lack of representation leads to. As one speaker quoted, ‘the most effective way to destroy people is to deny and obliterate their own understanding of their history.’2 The fact is, there have been LGBTQ+ individuals living across the country for, well, all of time. And there are sources which show this, although they can be difficult to find. Many of the difficulties in finding these resources relate to the fact that society has historically stigmatised and even criminalised homosexuality and gender non-conformity. As a result of this, sources will generally use different (often highly uncomfortable or offensive) terms. A researcher might find themselves having to search for descriptions of ‘perverts’, ‘unnatural acts’ or ‘character defects’. Such sources are often written from the perspective of the organisations which enforced repression and censorship – we have relatively few LGBTQ+ voices. Also, archivists generally do not have time to list documents at item-level, which means that specific LGBTQ+ items are often not picked up in the catalogue. For example, in the past some people believed lesbianism was linked to mental health, and so the records of Hatton Asylum are a potentially useful source – somewhere that a casual researcher might not think to look. I would argue that it is part of the responsibility of the archive to ensure that our whole diverse history is represented as best as possible. So, what can be done? Firstly, we can try and make the sources easier to find by non-specialist researchers, through the production of a research guide, engagement with LGBT History Month and by presenting some of the stories from our archives on websites like Our Warwickshire. But we also need to make sure we are capturing and preserving the records of LGBTQ+ individuals and groups from today. This doesn’t need to be the task of the archivist alone. We have, in this website, an amazing opportunity for individuals and communities to share their own histories in their own words. I have no doubt that some of the stories already online are by LGBTQ+ folk, and of course they are as valid as anything! But it would be great to see, if people feel comfortable, stories which share the past experiences of life in Warwickshire through a specifically LGBTQ+ lens. These could be anything relevant: activities of local (or national) groups, personal responses to political changes and movements, love letters, the experience of seeking hormones from a doctor – the list goes on and I wouldn’t want to try and dictate what was worth sharing. But maybe you’d like to think about how your personal histories could help future generations understand the experience of LGBTQ+ folk today. 1 Rommi Smith with Jenni Molloy and Juliet Ellis. “‘The map where we meet and other queer stories’: writers as cartographers on the crossroads of change (work in progress),” (conference paper, LGBTQ+ Archives, Libraries, Museums and Special Collections: “Without Borders”, London, June 22, 2016). 2 Prof. Aaron Devor, “Trans* History in the Raw: Highlights from the Transgender Archives”, (conference paper, LGBTQ+ Archives, Libraries, Museums and Special Collections: “Without Borders”, London, June 23, 2016). Any chance of adding links to your new LGBTQ+ resource sheet and pamphlet? Thanks for posting this blog. Absolutely – if you scroll down to ‘LGBTQ+ History’ you should find a link to our information pamphlet.